Two streets in Sutton were taken over by kids when Sutton became one of the first local authorities in London to close roads and allow children to play safely outside their own front door. 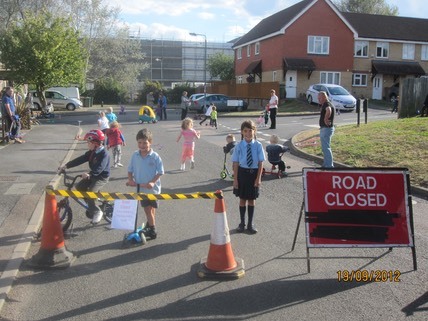 The idea of temporarily closing the road to traffic came about when two Bristol mothers, keen to give their children a taste of the simple freedom they themselves had enjoyed growing up, decided to ask the council for a one-off closure. Kathy McGuinness, founder of Local Mums Online, tweeted 'Reclaim the streets mums, these mothers did!' with a link to the story of the Bristol mothers' road closures. The two roads, Devonshire Road and Buckhurst Avenue in Carshalton, which piloted the scheme between 3.30pm and 5.30pm were carefully chosen to cause minimum disruption to traffic. The council granted Special Event Traffic Orders to allow the closure. The Orders are usually used for attractions like Notting Hill Carnival and Tour de France, but this year more than usual have been handed out for the Olympic Torch Relay and Jubilee Street Parties. Local Mum and Playing Out organiser Caroline Brown commented: "It was really straightforward to organise and almost everyone responded positively. The council were very accommodating and the one or two objections I had from residents were soon withdrawn when they realised what a wonderful event it would be." 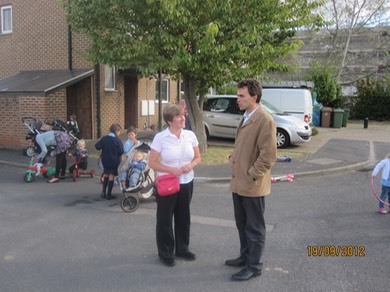 Tom Brake, MP for Carshalton and Wallington, who visited both streets during the event commented: "This is a fantastic idea and we fully support it. It brings local people together and builds communities as well as having great benefits for local children." Local Mum Kate Webb added “We have had the most amazing day. I have so many nostalgic memories of playing outside. Where I grew up playing outside was something you took for granted, but these days too often kids get home from school and then sit in front of the TV or computer. This gives them the chance to play safely outside. I hope we have lots more days like this in Sutton." "We are delighted with the way Local Mums have organised this event," added Ruth Dombey. "We are confident that the pilot scheme will be a success and we can roll out the scheme across the Borough." If you are interested in organising a Playing Out event for your road then please let the Council know as soon as you can. We have produced guidance notes and an application form which we need to receive at least six weeks before your event date. You can download them here. The application form includes a letter template that you can use to help you notify everyone in your street. Although the road may be closed, people who live there must still be allowed access to drive to and from their properties.� As a result, you will need to have people at each end of the street warn cars so you will need to recruit friends or neighbours to help on the day. The Council can loan you Road Closure signs to use on the day once your application is approved. The�Playing Out�web site has lots of information about reclaiming the streets for children and ideas for games and activities you can organise.